A truly amazing trip of a fascinating island. Our tour guide Ivan organized everything extremely well, and had an excellent relationship with all of us. A truly amazing trip of a fascinating island. Our tour guide Ivan organised everything extremely well, and had an excellent relationship with all of us. Bienvenido a Cuba! Welcome to Cuba! A complimentary arrival transfer is included with your trip. Please ensure you provide your flight details to your booking agent at least 14 days prior to travel so the transfer can be organised. There will be a welcome meeting at approximately 6pm this evening. Please expect a letter from your leader in the afternoon of Day 1 to confirm the place of your meeting (if by 5pm you cannot locate this letter then please ask your guesthouse owner if one has been delivered, or ask to call our assistance line listed in the "Problems and emergency contact information" section of this document). We'll be collecting your insurance details and next of kin information at this meeting, so ensure you have all these details to provide to your leader. The tour briefing is generally followed by an optional group dinner. As there's a great deal to do in Havana, we recommend staying a few extra days to make the most of this exciting city. If you need help booking extra accommodation, our reservations team will be happy to assist. If you arrive early, please note most activities in Cuba can only be booked through the tourist desk in the lobbies of the larger hotels or direct with the venue. Otherwise, there are plenty of good museums to check out, including the Museo de la Revolucion and the Museo Nacional de Bellas Artes. 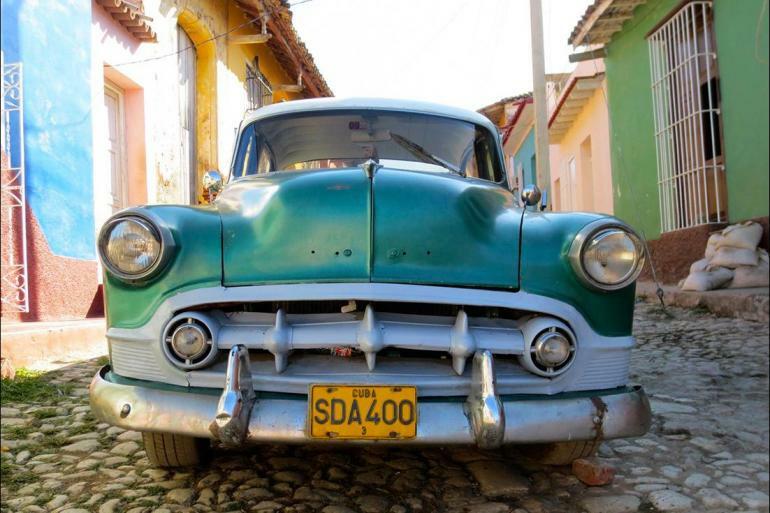 Spend the morning enjoying a short tour around Old Havana. This well-preserved part of the city was designated a World Heritage Site in 1982. The streets are lined with colonial architecture, 16th-century fortresses and many beautiful churches. Next head to Callejon de Hamel, an alley located in Havana's working class Cayo Hueso quarter. Adorned with the evocative Santeria murals of local artist Salvador Gonzalez, this lively street is Havana's centre of Afro-Cuban culture. Every Sunday afternoon it plays host to famous Afro-Cuban rumbas. Continue on to the community of Las Terrazas, the pioneering ecovillage dates back to a reforestation project in 1968. Meet some of the residents and learn how they work together to support their neighbours, as well as showcasing their open studios, woodwork and pottery workshops. Utilise some of the Spanish phrases to interact with the locals that your leader has taught you on the bus. Finally head to Soroa, heavily forested Sierra del Rosario to check in to your guesthouse for the night. In the morning, enjoy a tour of an orchid garden, which boasts 700 species of orchid. You'll also have the option to take a stiff one-kilometre climb up a mountain path to a lookout, and a short hike to a nearby waterfall. Head towards Vinales, stopping in at a Finca de Plantas Medicinales (A Herb Farm) to learn about local herbs and their medicinal properties. Because of international sanctions against Cuba, the island nation has had to find ways to be self-sufficient. One of these is to develop its own medicines, many of which are herbal. You'll see how herbs are grown, dried and crushed before being sent to a factory to be processed into medicines. Then, drive the short distance to the final destination of the day, the small town of Vinales in Pinar del Rio Province. Surrounded by limestone cliffs, the scenery around Vinales is some of the most picturesque in Cuba. On arrival, your leader will take you on a short orientation walk of the town. This morning your leader and a local guide will take you on a half-day walking tour. 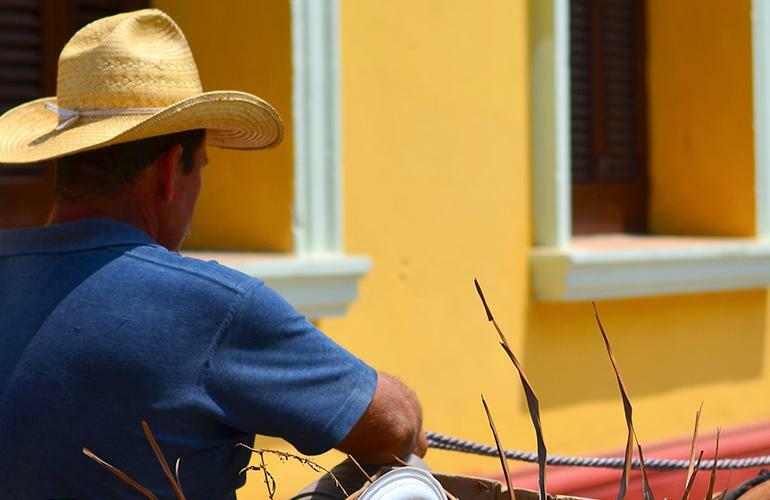 Visit a local farm where you'll have the opportunity to experience the 'guajiro's' way of life. Depending on the season, while at the farm you can choose to relax or help out with daily farm activities, such as toasting and grinding coffee or harvesting yuca, corn or tobacco. This is also your opportunity to marvel at the speed and skill of the locals cigar rolling technique. In the afternoon, you could even visit a bodega in town, where Cuban families collect their government-appointed rations. Vinales is a great place to mix with the locals, who love nothing better than to drink rum and dance the night away. In the evening, enjoy an informal salsa lesson. We recommend you eat dinner at a local eco-farm – the leader will assist with this if it interests you. Afterwards, perhaps practice your new moves to some live music on some of the dance floors in town. Today travel back to Havana, passing by the neighbourhood of Jaimanitas in Havana's outer western suburbs, also known as Fusterlandia. The artist Jose Fuster has brightened up the area by rebuilding and decorating over 80 houses (including his own) with ornate murals and domes. The project includes a park with giant chess boards and an Artists’ Wall, which has been compared to Antonio Gaudi's mosaic wall in Barcelona. Unfortunately there isn't time to enter Fuster's house but the area is still well worth a visit. You have a free afternoon to take a tour or simply stroll the streets or malecon. In the evening, head out on the town with your new travel friends. Havana's nightlife is varied and lively. Put your new salsa skills into practice at its many bars and clubs or perhaps check out a cabaret show.